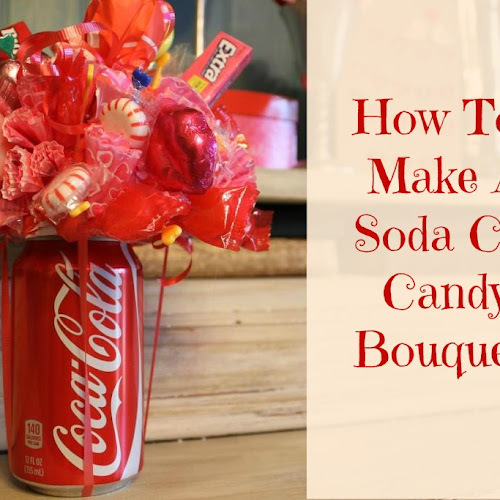 than one color to jazz it up or to go with a party theme. but actually it is three different shades/patterns of blue. two, three, or more very different colors of deco mesh. you don't paint the wreath form, dark green wires might show. so add a second coat if too much of the green is showing through. to skip this step and the next one but they can be hard to find. 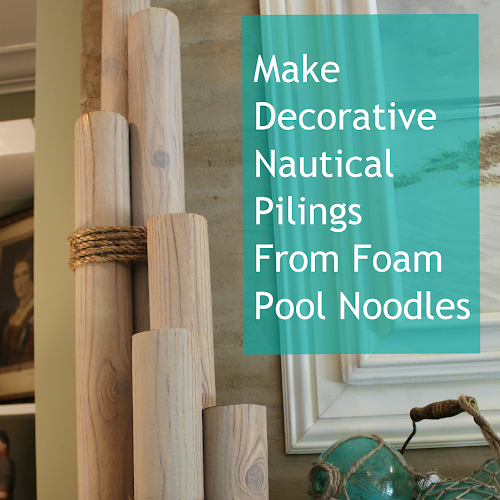 them online if you don't like this homemade wreath base. The wire wreath forms come in different sizes. Lobby. Jo Ann's prices are similar; Michaels' are a little more. Next, add the chenille stems to the wreath form. Put at least 7 stems around the outer ring. is on on opposite side of the outer wire at that point. (the "good" side, the rounded up side) of the wreath form. out to be able to "embrace" the deco mesh as you add it on top. where you placed the outer ring of chenille stems. I put 7 chenille stems on the inside ring also. just like you did the outer ring. hold the deco mesh at the places I wanted it to bunch. need to add more attachment places too but it is easy. 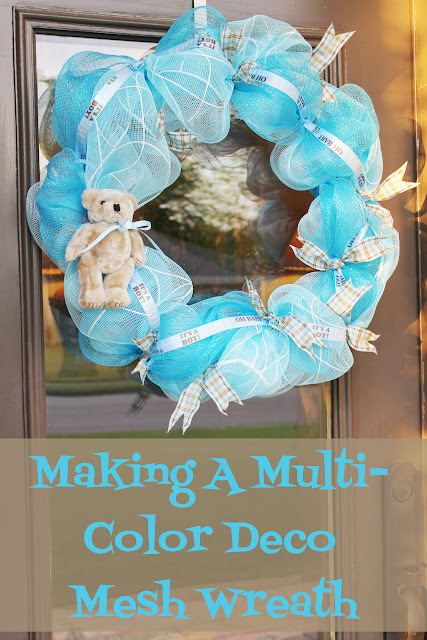 The base color for this wreath is the lightest blue deco mesh. To start, unwrap the mesh and unroll several feet of it. gathering point that you will attach to the wire frame. accordian pleat) and keep it pinched tightly. the "arms" of the chenille stem that you have glued down. Twist the arms around the gathered point a couple of times. outer wire to see if you like the size of the "pouf" or "bunch"
it smaller, redo the pleat closer to the original one. Twist the arms around your second gather. Continue around the outer wire gathering and attaching the mesh. the wreath without cutting the deco mesh. 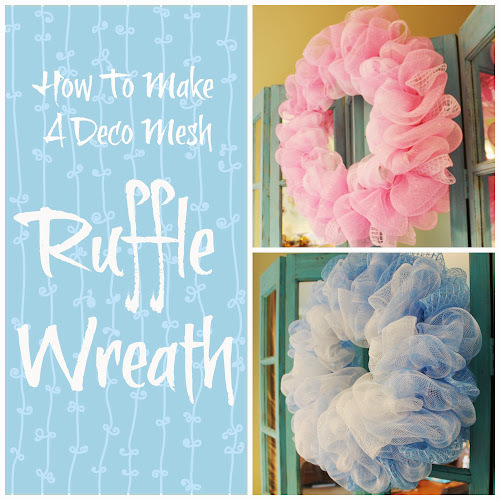 Attach mesh poufs around the inner ring of the wreath. want on the wreath, you can cut it. Leave about 12" of tail. stem to secure the end of the tail onto the wreath form. want to have more points of attachment for the mesh. rolls of deco mesh for about $8; patterns are about $12. yet but they have a good selection and reasonable prices. degrees of quality...just FYI...they are not all the same. of mesh has been added. Hide and attach the tails the same. frame. Any cut ends will be raggy...just tuck them in. width. You get more bang for your buck with the 21" width. There are 10" wide rolls out there that cost almost the same. stem arms still have plenty of room to add more layers of poufs. Attach, gather and pouf the 10" mesh the same as the wider mesh. 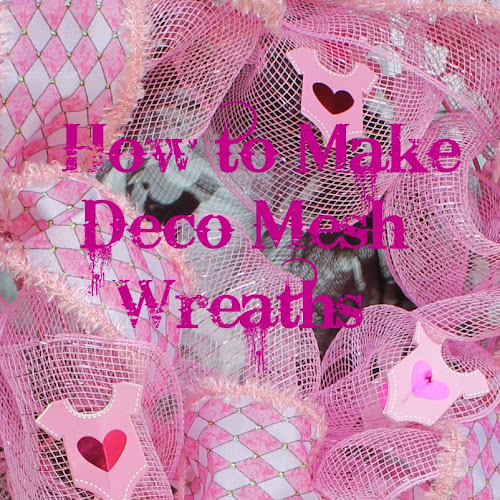 deco mesh wreaths...or make doubles while you are at it. dark blue and tan nursery so I tried to go with those colors. with the chenille stem open arms also. out for a blue ribbon with little footprints on it. and then attached directly to a ring on the wreath form. wreaths is to add lengths of ribbon to the wire frame. separate the mesh poufs and find a wire ring on the form. back in place and there you have another pop of color. stems, twist them and bring each end to the back of the wreath. light weight and do not require much support. I have a habit of, when in doubt, under-embellishing something. You could cut letters out of craft foam to get the same effect. painted them a tan color with acrylic craft paint. add a little hot glue and attach them directly on the mesh. The "A" however fell into a "ditch" in the mesh. one on the middle bar of the letter the same way. around the wire frame and the "A" was able to stand on its' own. 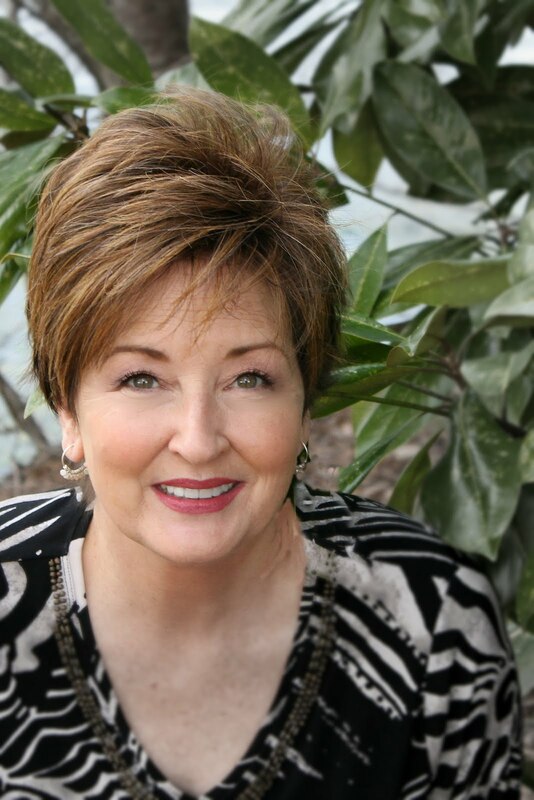 arrive on Mother's Day! I will keep you posted. type wreaths or dispays on the front of an actual home where a newborn lives. It's a cute idea, but unfortunately I am not at all creative and would make a mess of it. It WOULDN'T turn out like yours.. :) It really is an inspiring idea for creative bloggers..
What an adorable wreath! And a FANTASTIC tutorial on how to make it. Love all the tips, like painting the wreath form and using the chenille stems. The addition of the name is the perfect finishing touch. I've been wanting to make a 4th of July wreath with the Deco Mesh and think I will use your idea and put USA on it! Going to pin it to refer back too. Thanks of sharing! Hi Kitty, Great tutorial! They have the mesh ribbon at my craft store but I wasn’t sure I could work with it, so I ended up buying a wreath. With the help of your tutorial I would love to try it now. Your wreath is beautiful and what a great idea for a gift. Thanks for the tutorial. Just too cute! How perfect for a baby boy! and a great tutorial! visiting from Ivy and elephants! A really fabulous wreath and wonderful details - thank you for the step by step directions so I can make one similar - just beautiful! 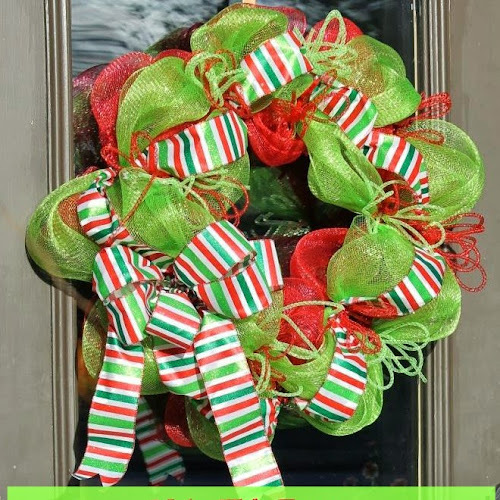 I love all the creative wreaths that you are able to make, what a gift you have for pretty! It's adorable. This wreath is beautiful! Thanks for the great tutorial! how sweet, and it would be a great baby shower decoration too. Thank you for the link to Mardi Gras Outlet. I love the wreath you created...especially the name. My first born is named Blake! Please help..when I tried to hot glue something to the mesh it melted. Am I doing something wrong? Thank you so very much. I have never made one of these type wreaths, so this will be a first for me. I can usually look over something and just make it. However everyone I have seen has been boxed up so I couldn't get to it to look it over good. Again thank you and I will give it a try now. "Wish me luck", by the way I do the same thing msmarciesm!